An alumnus of Oxford University and the University of Cambridge, Ahsan Zaman is a media & publishing entrepreneur and investor based in London. Being the Founding Director of IoT World Forum, London, Ahsan is passionate about innovating the IoT (Internet of Things), Digital Health and Machine Learning Ecosystems. Ahsan is currently the Executive Director of WORLD MEDIA ONLINE, a London-based B2B publishing & media house whose clientele includes Qualcomm, Huawei, IBM, Cisco, HP, SAP, Ericsson, Nokia and Oracle. Under Ahsan’s leadership, WORLD MEDIA ONLINE has evolved from a regional publishing company in Europe into a global media enterprise. Previously, Ahsan was head of global PR and Marketing at Connect-World in London. 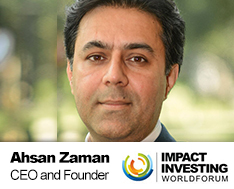 As a thought leader on Social Impact, Ahsan also serves on the advisory board of Impact Investing World Forum (IIWF) based in London, one of the leading international think tanks and forum for the global impact investing sector, that has representation from United Nations UNDP-UNSIF, Deutsche Bank, Barclays Wealth, Big Issue Group, CASE Foundation and MacArthur Foundation. Being part of the global Oxbridge alumni network, Ahsan is actively engaged in supporting entrepreneurial & impact investing initiatives at Oxford and Cambridge. He publishes widely in leading technology magazines and presents and chairs at numerous global conferences.